The role of subterranean termites in recycling of wood is fundamental for the ecosystem. They are responsible for the disappearance of many tons of decaying wood every season, and all their components are reintroduced into the cycle of life. But, there is a problem. Cellulose and a matrix of lignin, the main components of wood, are not digestible for most of the animals. Their secret is inside them, and viewers will see the myriad of tiny and microscopical living beings that inhabit the intestine of the termites. The tiny symbionts that are capable to break down the molecules of cellulose and to liberate the molecules of sugar for the nourishment of termites. Termites are responsible for the disappearance of many tons of decaying wood. Their components are reintroduced into the lifecycle. but there is a problem. Cellulose and a matrix of lignin,cannot be digested by most animals. So how do termites do their work? We discover the secret when we look at the myriad of microscopic living geings inhabiting the intestine of the termite. These symbionts are capable of breaking down the molecules of cellulose and liberating molecules of sugar for nourishment. All this and more is explained in this program. Macrophotography and microphotography show the best kept secrets of the forest! 2.) Chapter 2: What are Termites? 3.) 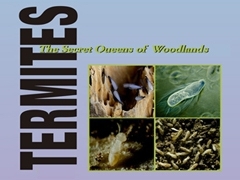 Chapter 3: Why can Termites Feed on Wood? 00:13:22Why can Termites feed on wood? 4.) Chapter 4: How do these Termites Live? 00:19:39How do these termites live?